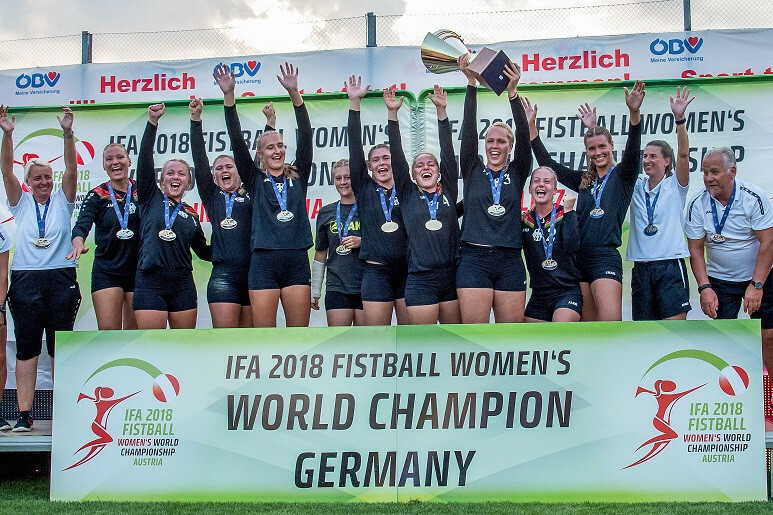 Germany successfully defended their women’s World Fistball Championship title in Linz today as they defeated Switzerland 4-1 in front of 2,000 spectators in the OBV-Arena. It was the Germans’ third successive world title in this International Fistball Association (IFA) event. The bronze medal went to Brazil, who defeated hosts Austria 4-0 in the third-place match. Switzerland, who had produced one of the results of the Championship in knocking out the hosts 3-2 in the semi-finals, could not withstand the power and efficiency of the champions. "It feels incredible to have defended the title. I still cannot believe it,," Anna-Lisa Aldinger, a member of th winning squad two years ago, said. Tanja Bognar, outstanding throughout the competition in the Swiss attack, was disappointed after the defeat. "I think so If you're in the final, you want to win too," she said. "We are disappointed that we did not beat the world champions. "But we have not been in the final since 2002 and we can be proud of that."